Like many who grew up in the '60s and '70s (and perhaps even '80s and later), Tim and Paul had the course of their lives changed by the 1966 Batman TV show, from the types of play they did growing up to their present-day interests. In this series, they discuss the show's allure and its failures, the arc of the show from satire to sitcom, its influences (the '40s serials and the comic books themselves) and the things it, in turn, influenced. Tim is an administrator of the Batman '66 Facebook page! SUPPORT "To the Batpoles!" and DeconstructingComics.com via Patreon! 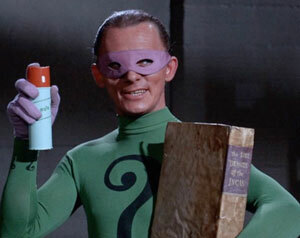 In Frank Gorshin’s third turn as the Riddler, the Prince of Puzzlers follows a very clear plan toward his goal of finding the Lost Treasure of the Incas, while taking credit for stuff Shakespeare wrote. Company man Batman, meanwhile, lauds the Incas' culinary achievements. Tim and Paul watch this arc and muse on its theme of preservation, the developments in Nelson Riddle’s music for death traps, and note that the Gotham City Museum building looks strangely familiar. An ongoing group research project into Batman '66! Two brothers, Tim and Paul, who grew up having their lives changed forever by Batman reruns in the '70s, discuss the series story-by-story, with other episodes set aside for research into how the show was made (including examining draft scripts) and other Bat-material somehow related to the show. There's not a moment to lose! To the Batpoles!